Like Jerusalem, 23 miles to its north, the ancient city of Hebron stirs deep religious and political passions, and has been the scene of heightened tension between Jews and Arabs for much of the last century. Hebron is revered as one of the four holiest places in Judaism (along with Jerusalem, Safed and Tiberias) and Jews had lived continouslythere for centuries until the small community was forced out after brutal massacres led by Arab residents in the early 20th century. After Israel recaptured the West Bank during the Six Day War in 1967, a number of Jewish families reestablished the community near the ancient Tomb of the Patriachs. As part of various peace agreements with the Palestinians, the Israeli government has withdrawn its presence from the majority of the city and now allows it to be administered by the Palestinian Authority. Though the site of conflict during the Palestinian War from 2000 to 2005, the Jewish area of Hebron is now relatively safe and tourists are free to visit the community and the Jewish biblical sites under the guarding eye of the Israel Defense Forces. The Hebrew word "Hebron" is derived from the Hebrew word for "friend" (haver), a description for the Patriarch Abraham, who was considered to be the friend of God. The Arabic "Al- Khalil" — literally "the friend" — has a nearly identical derivation, and also refers to the Patriarch Abraham (Ibrahim), whom Muslims similarly describe as the friend of God. Hebron, which rises 3,050 feet (926 meters) above sea level, has a long and rich Jewish history. It was one of the first places where the Patriarch Abraham resided after his arrival in Canaan. King David was anointed in Hebron, where he reigned for seven years. One thousand years later, during the first Jewish revolt against the Romans, the city was the scene of extensive fighting. Jews lived in Hebron almost continuously throughout the Byzantine, Arab, Mameluke and Ottoman periods. It was only in 1929 — as a result of a murderous Arab pogrom in which 67 Jews were murdered and the remainder were forced to flee — that the city became temporarily "free" of Jews. 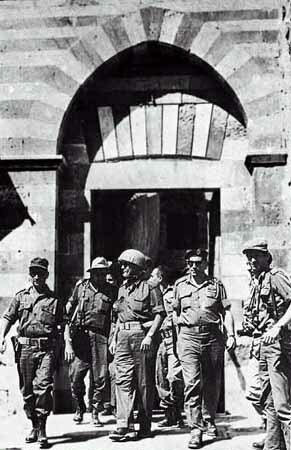 After the 1967 Six-Day War, the Jewish community of Hebron was re-established. On April 4, 1968, a group of Jews registered at the Park Hotel in the city. The next day they announced that they had come to re- establish Hebron's Jewish community. The actions sparked a nationwide debate and drew support from across the political spectrum. After an initial period of deliberation, Prime Minister Levi Eshkol's Labor-led government decided to temporarily move the group into a near-by IDF compound, while a new community -- to be called Kiryat Arba -- was built adjacent to Hebron. The first 105 housing units were ready in the autumn of 1972. The Jewish community in Hebron itself was re-established permanently in April 1979, when a group of Jews from Kiryat Arba moved into Beit Hadassah. Following a deadly terrorist attack in May 1980 in which six Jews returning from prayers at the Tomb of the Patriarchs were murdered, and 20 wounded, Prime Minister Menachem Begin's Likud-led government agreed to refurbish Beit Hadassah, and to permit Jews to move into the adjacent Beit Chason and Beit Schneerson buildings in the old Jewish Quarter. An additional floor was built on Beit Hadassah, and 11 families moved in during 1986. Over the last two decades, many other Jewish properties and buildings in Hebron have been refurbished and rebuilt. The Cave of Machpelah, or Tomb of the Patriarchs, is the world's most ancient Jewish site and the second holiest place for the Jewish people, after the Temple Mount in Jerusalem. The cave was purchased by Abraham as a burial place for his wife Sarah some 3,700 years ago, along with the trees and field adjoining it, the first recorded transaction of a Hebrew buying land in Canaan (Genesis 23). Abraham, Isaac, Jacob, Rebecca, and Leah were all later buried in the same place. These are considered the patriarchs and matriarchs of the Jewish people. The only one who is missing is Rachel, who was buried near Bethlehem where she died in childbirth. 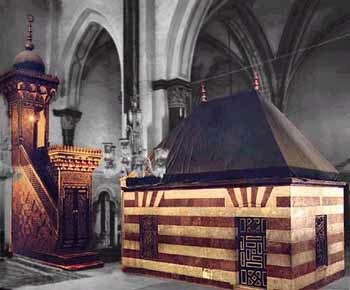 Muslims believe that Joseph is also buried here, though Jews think he was buried in Nablus. The building covering the cave was constructed roughly two thousand years ago by Herod. The 40-60 foot high walls are similar to those of the Temple Mount. Since Herod's time, the structure has been used by foreign conquerors as a shrine to their own religions. Thus, the Byzantines and Crusaders transformed it into a church and the Muslims converted it a mosque. About 700 years ago, the Mamelukes conquered Hebron, declared the structure a mosque and forbade entry to Jews, who were not allowed past the seventh step on a staircase outside the building. The structure is divided into three rooms: Ohel Avraham, Ohel Yitzhak, and Ohel Ya'akov. Presently Jews have access to Ohel Yitzhak, the largest room, only 10 days a year. The tombs are all underground. The visible parts are covered with tapestries and cenotaphs. A 700-year-old stained-glass window adorns the tomb of Jacob and Leah, which are in an adjoining courtyard opposite the monuments to Abraham and Sarah. Hebron contains several other sites of Jewish religious and historical significance, including the Tombs of Othniel Ben Kenaz (the first Judge of Israel) and Avner Ben Ner (general and confidante to Kings Saul and David), and Ruth and Jesse (great-grandmother and father, respectively, of King David). Victims of the 1929 pogrom, as well as prominent rabbinical sages and community figures, are buried in Hebron's ancient Jewish cemetery. In recent years, Hebron has been the site of many violent incidents, two of which stand out. In May 1980, Palestinian terrorists murdered six Jewish yeshiva students and wounded 20 others, who were returning from prayers at the Tomb of the Patriarchs. In February 1994, a Jew named Baruch Goldstein opened fire on Muslim worshippers at the Tomb, killing 29 and wounding 125. Hebron is home to approximately 120,000 Arabs, 500 Jews and a handful of Christians. On the outskirts of the city are glass-blowing, pottery and woodworking shops and, near the center of town, a large visitor center. The Arab market is similar to those elsewhere, but given the volatility of the city, visitors are usually discouraged from going there. The city also has a small museum of artifacts used in the area through the centuries. Though Israel regained control of Hebron in 1967, the Cave of Machpelah has remained under the authority of the Muslim Waqf (Religious Trust), which continues to restrict Jewish access. No visitors are allowed inside during Muslim prayer times, Fridays or Muslim holidays. Following the signing of the Interim Agreement on September 28, 1995, authority over most civilian matters concerning Hebron's Arab residents was transferred from the IDF Civil Administration to the Palestinian Authority and/or the (Arab) Municipality of Hebron. Those services which remained the responsibility of the Civil Administration were transferred to the Palestinian Authority and the Municipality following the IDF redeployment in Hebron in 1997. Since then, the Palestinians have controlled roughly 80 percent of the city and Israel 20 percent (including the area where Jews are living). International observers patrol the city to help monitor the situation. At the time of Abraham, the Canaanite town in this place was known as Kiryat Arba. The name was later changed to Hebron (Joshua 14:15). Today, Kiryat Arba is the name of a suburb of Hebron, five minutes from the Cave of Machpelah and the heart of the city. Established in 1971, Kiryat Arba was the first renewed Jewish community in Judea and Samaria. Today, Kiryat Arba is home to more than 6,000 Jews who have a reputation for being among the most zealous defenders of the idea that Jews have a right to live in the West Bank. The town has educational institutions from pre-nursery school through post-High school, modern medical facilities, shopping centers, a bank and post office.